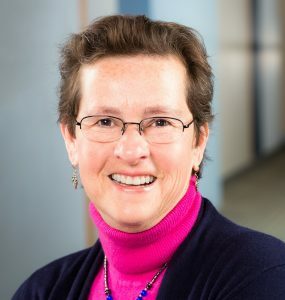 Empathetics’ co-founder, Dr. Helen Riess is a psychiatrist and medical educator at Massachusetts General Hospital and Harvard Medical School who developed novel empathy training based on the neuroscience of empathy at MGH. Her training was tested in an initial pilot study at the Massachusetts Eye and Ear Infirmary with evidence of significant improvement in physician empathy. She then conducted a randomized controlled trial of the empathy training with her research team from the Empathy and Relational Science Program at MGH. The results of this trial demonstrated significant improvement in patient ratings of physician empathy. The brief training consisted of 3 hours of empathy education spaced over 6-8 weeks. Her team then conducted a one year follow up study at Mass. Eye and Ear Infirmary with the same cohort of physicians, and found that the improvement in physician empathy was retained one year later. These studies have been published in peer-reviewed medical journals. Empathetics, Inc., is an independent for-profit company founded in 2011. The initial Empathetics products are based upon the subject matter developed at Massachusetts General Hospital. The subject matter of the initial products has been exclusively licensed by MGH, together with the registered trademark “E.M.P.A.T.H.Y. ®,” to Empathetics Inc., but Empathetics is not part of nor is it sponsored by MGH. Empathetics develops its own copyrighted content to provide interpersonal communications education in order to improve human engagement. The marks “Empathetics” “Empathetics- Neuroscience of Emotions” and the associated logo are trademarks owned by Empathetics, Inc.
Dr. Riess’s ground breaking empathy training research was highlighted in the New York Times as the first study to demonstrate that empathy can be taught. This finding was an answer to two decades of major media headlines demanding more empathic care from medical professionals. 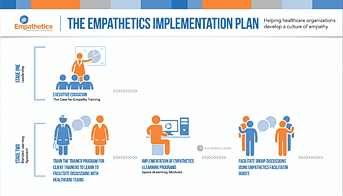 Empathetics’ empathy training has been presented to thousands of physicians and nurses around the world, and Empathetics, Inc. has made the training available in web-based format to allow implementation throughout large healthcare systems. Helen Riess, M.D. is Chief Scientist for Empathetics. Dr. Riess is Associate Professor of Psychiatry, PT, at Harvard Medical School and Director of the Empathy and Relational Science Program at Massachusetts General Hospital. She is a core member of the Consortium for Research on Emotional Intelligence in Organizations (CREIO) and faculty of the Harvard Macy Institute. Dr. Riess is a psychiatrist who developed an empathy training approach based on research in the neurobiology and physiology of empathy that has been rigorously tested in pilot studies and a randomized, controlled trial at MGH. She completed her residency and Chief Residency at MGH and Harvard Medical School. Dr. Riess has devoted her career to teaching and research in the art and science of the patient-doctor relationship. Dr. Riess received her M.D. from Boston University School of Medicine and her B.A. From Wesleyan University. Diane Blake is the Director of Learning at Empathetics. Her responsibilities include managing product development and client relations processes, the learning management system, as well as the website and marketing functions. Ms. Blake came from Quality Interactions as Director of Product Development and Client Affairs and her primary role was to manage the distribution of their E-Learning Program and to work closely with organizations to ensure their learners were successfully trained. Prior to that, Ms. Blake worked at Houghton Mifflin as a Web Developer/Project Manager and BuyerZone.com as a Web Production Specialist. Ms. Blake holds a Bachelor of Science degree in Management/Marketing from the University of Connecticut. Continuing a career of over 10 years in Healthcare, Ms. Blake is excited about the mission of Empathetics and having a positive influence on the healthcare community. Dr. Alice Domar, Ph.D, is an associate professor of obstetrics, gynecology and reproductive biology, part-time, at Harvard Medical School and a practicing licensed psychologist. She is also the director of integrative care at Boston IVF. 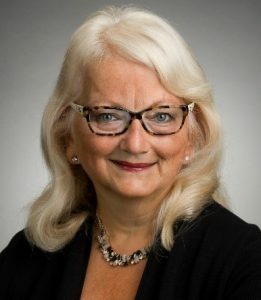 She lectures nationally and worldwide to physicians and other healthcare professionals on the importance of empathic skills communication and is an engaging facilitator for Empathetics, Inc. She also is a specialist on the application of mind/body approaches to various health conditions with a focus on women’s health. Joan Lowery, M.Ed. is a professional communicator with over 30 years of experience who specializes in several areas of communication skills training. She is passionate about contributing to the future of healthcare delivery by helping professionals optimize their patient-centered communication skills. 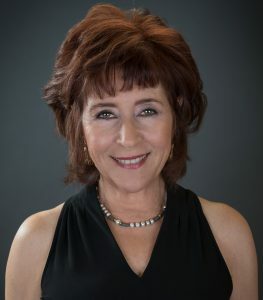 Her articles and chapters on communication skills-related topics have been published in numerous healthcare and mainstream news outlets and books. She was the editor of Culture Shift, A Leader’s Guide to Managing Change in Health Care (American Hospital Press). Joan was also an award-winning broadcast and print journalist and worked for news organizations such as CNN, Associated Press, CNBC-TV and the Discovery Channel. Lauris Woolford, M.S. is an executive coach and leadership consultant with over 33 years of experience in coaching leaders and teams, and in supporting positive cultural transformations. She brings a leadership perspective gained from managing a corporate university and leading an Organization Development division for a Fortune 500 financial services company. Prior to her retirement from banking she was Executive Vice President of Organization Development and Planning for Fifth Third Bank, where she noted the profound impact emotional intelligence and coaching had on leaders’ performance at every level of business. Lauris has been with Empathetics since its inception as a facilitator and trainer. On October 21st, 2015 we announced our strategic partnership with Planetree, an organization that partners with healthcare organizations to transform the delivery of care. The strategic partnership will enable hospitals to access the Empathetics training tools to meet the rigorous criteria required to earn the prestigious Planetree Designation for Patient-Centered Care. On November 17th, 2015 we announced our strategic partnership with The Arnold P. Gold Foundation, an organization that works with healthcare professionals in training and in practice to instill a culture of respect, dignity and compassion for patients and professionals. The strategic partnership will enable medical schools and nursing programs across the United States to access the Empathetics training tools for medical and nursing students, equipping them with the empathic communication skills to provide compassionate healthcare to patients. Donald M. Berwick, M.D., M.P.P, F.R.C.P.is President Emeritus and Senior Fellow, Institute for Healthcare Improvement, is also former Administrator of the Centers for Medicare & Medicaid Services. A pediatrician by background, Dr. Berwick has served on the faculty of the Harvard Medical School and Harvard School of Public Health, and on the staffs of Boston’s Children’s Hospital Medical Center, Massachusetts General Hospital, and the Brigham and Women’s Hospital. He has also served as Vice Chair of the US Preventive Services Task Force, the first “Independent Member” of the American Hospital Association Board of Trustees, and Chair of the National Advisory Council of the Agency for Healthcare Research and Quality. Elizabeth G. Armstrong, Ph.D. is the Director of the Harvard Macy Institute and Clinical Professor in Pediatrics at Harvard Medical School. She has held positions at Harvard Medical School since 1984, including Director of Curriculum 1988-1992 and Director of Medical Education 1992-2001. She has played a leadership role in designing, implementing and expanding Harvard’s New Pathway curriculum. In 1994 with funding from the Josiah Macy Jr. Foundation, she created and continues to direct the Harvard-Macy Institute. The Institute offers professional development programs for clinician educators and leaders of reform in healthcare education worldwide. Mark A. Kelley, M.D., M.A.C.P. is a physician educator at the Massachusetts General Hospital and a visiting scholar at Harvard Business School. He recently served as an Advanced Leadership Fellow at Harvard University. As professor of medicine at the University of Pennsylvania, he held a variety of leadership roles including Vice Dean for Clinical Affairs, when he led physician and hospital network development of the University of Pennsylvania Health System. Thereafter, Dr. Kelley served as Executive Vice President and Chief Medical Officer for the Henry Ford Health System, one of the nation’s leading integrated delivery systems. Joe Mandato has been an investor, executive and entrepreneur in the life sciences. He is a managing director of DeNovo Ventures, a venture firm investing in the life sciences. He led companies developing solutions to healthcare problems including Origin Medsystems, Gynecare, and loptex. He was Captain in the U.S. Army Medical Service Corps. He is on the boards of Embrace and Save the Children. He holds a Doctor of Management degree from Case and is a lecturer at Stanford University where he co-teaches the class Medical Device Innovation. He was a 2012 Fellow in the Harvard University Advanced Leadership Initiative. Peter H. McNerney, Senior Advisor, Thomas, McNerney & Partners and 2014 Fellow, Harvard Advanced Leadership Initiative. Pete has over 30 years of health care operating and venture capital experience. In addition to co-founding Thomas, McNerney & Partners, Pete co-founded Coral Ventures in 1992, where he was responsible for health care investing. Pete was a co-founder and Managing Partner of The Kensington Group, a firm specializing in providing management services to early stage companies in the health care field. He has served as President of the Minnesota Venture Capital Association and is on the Board of Trustees of Blue Cross and Blue Shield of Minnesota. A Certified Public Accountant, Pete received a B.A. from Yale and an M.B.A. from Stanford University. Nathaniel Opperman, is the President of Key Venture Partners, LLC, a venture capital company based in Minneapolis, MN specializing in angel and early stage investments with a primary focus in the health care/life sciences, software, and legal services sectors. He manages the portfolio of companies, including investments in NeoChord, NxThera, InterValve, and Pursuit Vascular. He serves as Chief Operating Officer of MSP Communications, a content marketing agency serving custom client needs and creating publishing platforms. Prior to Key Venture Partners, Nathaniel was Chief Operating Officer for Key Professional Media, a lawyer ratings company. Previously he worked in various financial roles with Medtronic, Wells Fargo & Company, and A.G. Edwards. Nathaniel joined the Board of Directors for Empathetics, Inc. with the company’s initial funding. Nathaniel holds an AB from Harvard College and an MBA from the University of Chicago Booth School of Business and is a CFA® charterholder. Empathetics, Inc. is an independent, for-profit company founded in 2011. The initial Empathetics products are based upon the research of Dr. Riess conducted at Massachusetts General Hospital. Empathetics licensed Dr. Riess’s subject matter material and the trademark “E.M.P.A.T.H.Y.®” from MGH. Although MGH receives royalties from Empathetics on sales of its products, MGH does not have an ownership interest in the company and does not sponsor or endorse the company. Empathetics develops its own copyrighted content to provide interpersonal communications education in order to improve human engagement. The marks “Empathetics”, “Empathetics – neuroscience of emotion” and the associated logo are trademarks of Empathetics, Inc.